Things are winding down at work with the impending holidays - less people are answering email and it's very quiet. I'm trying to enjoy these moments and get as much done as possible, because I know January is going to come around with a big shock and I'll feel as though I got knocked to the ground. Although I didn't make it to the Rockefeller tree this year, my friend Lauren and I did take an adventure down to the tree on Wall Street during lunch one day and I have to say, it was equally as nice and way less crowded. Two positives on my end! I'm working through the end of this week and heading back to Connecticut on Friday evening to see my family. This year we're doing Christmas brunch, different from what we normally do, but since brunch/breakfast is my favorite meal I'm looking forward to it. Then the day after Christmas, my mom, sister and I have a 6am flight to Charleston for the week. I have been DYING to go to Charleston for years so I am psyched, and am looking forward to slightly warmer weather. It may not be tropical, but at this point I'll take anything. Happy holidays! 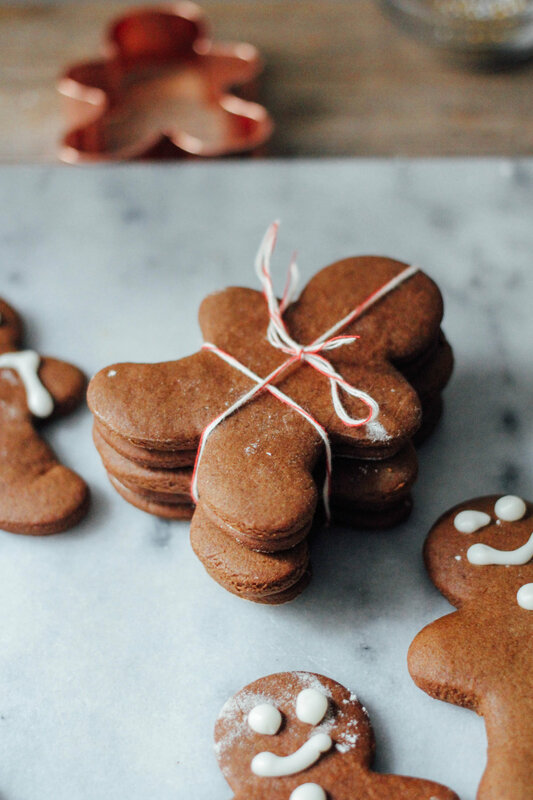 I have always had an obsession with gingerbread cookies. Sometimes I make them when it's not even the holiday season. One of my dreams is to many extravagant gingerbread houses and create a big scene of out them. That being said, this year I toned it down with just the typical gingerbread man cookie. If you still haven't baked for the holidays (how could you!) these are easy and fun! In a medium bowl, whisk together flour, baking powder, baking soda, salt, ginger, cinnamon, nutmeg, and cloves until well blended. In a large bowl beat butter, brown sugar, and egg on medium speed until well blended. In parts, add molasses, vanilla, and lemon zest and continue to mix until well blended. Gradually stir in dry ingredients until blended and smooth. Divide dough in half and wrap each half in plastic and refrigerate for 3 hours. Return to room temperature before working with it again. Preheat oven to 375 degrees F. and line baking sheets with parchment paper. Place 1 portion of the dough on a lightly floured surface, sprinkle with flour and roll to about 1/4 inch thick. Use additional flour to avoid sticking if necessary. Cut out cookies with desired cutter and space 1 1/2-inches apart on baking sheets. Bake 1 sheet at a time for 7-10 minutes. Remove from oven and allow the cookies to cool on a wire rack until firm. For glaze, mix confectioners sugar, butter, water and vanilla until thick frosting forms. Transfer to piping bag and decorate.